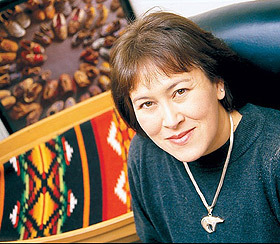 Dr. Lori Arviso Alvord, the first Navajo female surgeon, returns to Augsburg College Feb. 13 and 14 to share the story of her journey from the reservation to become a surgeon and her work to combine Navajo philosophies of healing with western medicine, to create models of healing environments. This convocation is sponsored by the Center for Counseling and Health Promotion, American Indian Student Support Services, and Augsburg for Adults. In order to encourage attendance at the Saturday convocation, WEC Saturday classes will be dismissed at 11:45 a.m. and will resume at 1:15 p.m.